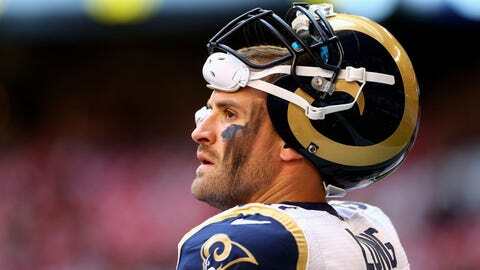 Chris Long is still searching for his first trip to the NFL postseason. ST. LOUIS — Chris Long isn’t going to preach. This isn’t his first rodeo. He’s been here before. Long stood at his locker on Monday afternoon, just as he had at the conclusion of his first five seasons. He answered question after question about the future. About why this time it will be different. Long has now played six seasons in the NFL since the Rams chose him with the No. 2 overall pick in the 2008 NFL Draft. Six seasons with nothing to do in January. Heck, six seasons now where St. Louis finished under .500. So Long isn’t the person to tell you it will all turn around next year. Yes, he’s just as hopeful as ever. He’s already looking forward to the 2014 season. He’s just not going to stand here and talk about it. "Hey listen, every year the community, the media, everybody is always trying to make predictions for how close we are — this, that and the other thing," Long says. "The reality of it is we’re only as good as our performance on the field, so I’m not going to get caught up in all of that. I’m definitely not going to get caught up in all that this offseason. I’m just going to focus on how I can help this team get better and focus on looking forward to the future. All that really matters is what we do on the field, and we won’t be able to do that until next fall. I think everybody in this locker room is ready to get back at it already, but it is what it is." Next weekend Long says he’ll be drinking a beer and watching football like a regular guy. That’s his reality at the moment. He’s 28 years old now. He’s poured his blood, his sweat, his tears and everything else he’s got into this franchise and he’s still going to be watching the playoffs on TV. The signs of progress are there, of course. There’s plenty of reason for optimism. The Rams went 2-14 in Long’s first season when Scott Linehan was fired and Jim Haslett served as the interim coach. Then things actually got worse the next year, 2009, under Steve Spagnuolo when the Rams went 1-15. St. Louis showed progress again in 2010, in Sam Bradford’s rookie year, when they went 7-9. But another 2-14 campaign the following season in 2011 showed that there are no guarantees in this league. So, yeah, winning seven games in each of the first two seasons under Jeff Fisher qualifies as progress. But it’s still not good enough. Long wants more. This isn’t what he signed on for. It’s not what he has worked for these last six years. He doesn’t want to be the guy drinking a beer and watching the playoffs on his television. "We feel like we’re right there, but obviously we’ve said that before so I’m not going to get caught up in preaching to the community or to the media how close we are," Long says. "We know how close we are and we’ll just have to go out and show that on the field in the fall." St. Louis finished the 2013 season with a 7-9 record and a roster that included 29 players who were in their first or second season. That group includes rookie starters like running back Zac Stacy, who was selected as the team’s rookie of the year, linebacker Alec Ogletree, wide receiver Tavon Austin and safety T.J. McDonald. The second-year starters include defensive tackle Michael Brockers, cornerbacks Janoris Jenkins and Trumaine Johnson, kicker Greg Zuerlein and Pro Bowl punter Johnny Hekker. There will be roster turnover. There’s always roster turnover. Some of the Rams’ most experienced players aren’t likely to be back. St. Louis has two first-round picks in the 2014 Draft — for now. General manager Les Snead told Peter King of The Monday Morning Quarterback that he’s willing to deal the No. 2 overall pick that the Rams receive from the Redskins. He’d like another first rounder and, because some team will covet South Carolina defensive end Jadeveon Clowney or will want to make sure they get the second-best quarterback in the draft, Snead will likely get what he wants. So the Rams are in position to get better. Now they have to do it. "This is a good time to get back and watch film again and kind of let things sink in," Long says. "If we all just focus on improving individually we will improve as a whole, and that’s basically the bottom line." Long doesn’t want or expect to be watching the playoffs from his couch again next year. "It will help motivate us, as if I needed any more motivation or we needed any more motivation," Long says. "Just pile it on and we’ll go to work."